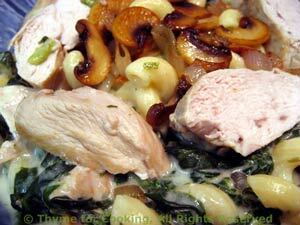 Chicken Breasts with Tarragon Cream, from Thyme for Cooking's Weekly Menu Planner. I cut the chicken in thick slices for this dish, making it more of a 'chicken' dish than a pasta. Adding the spinach makes it a one-dish dinner of an easy meal during this busy week.